I hope everyone is have a great, and safe Fourth of July. I got a lot of rest this weekend and spent a good amount of time with family and friends. I also found time to venture out back with a MBombay Gaaja and a bottle of Ommegang’s 2015 Belgian Independence Day. 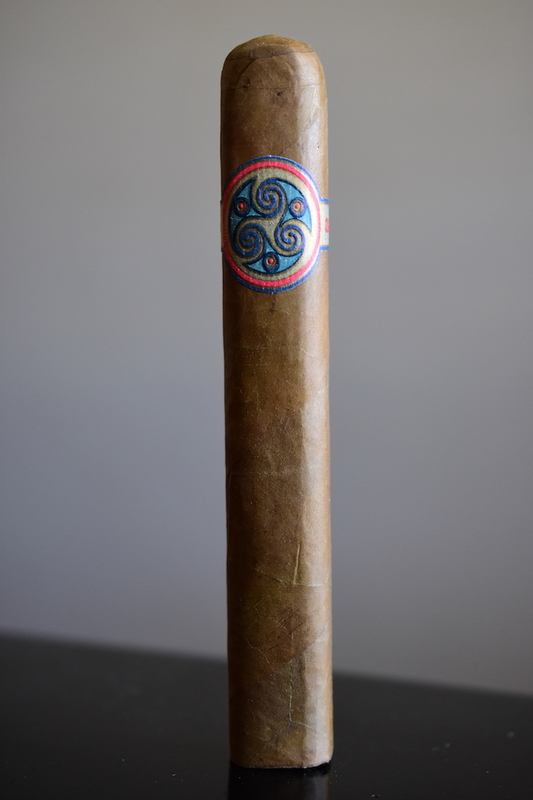 The Mbombay Gaaja is the latest offering by Mbombay Tobak which is due out later this month. The word “Gaaja” comes from the Sanskrit word for elephant. 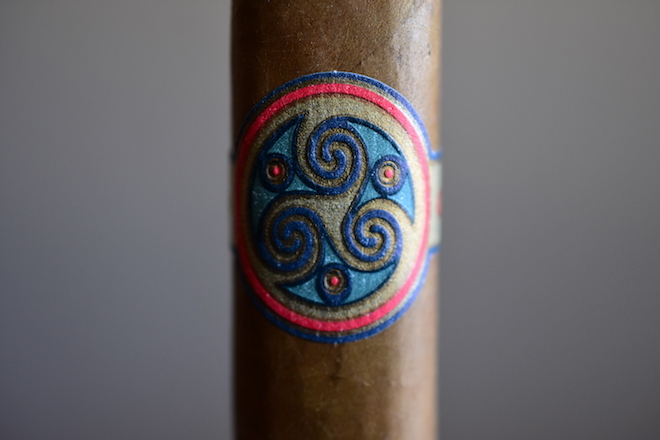 The Gaaja is comprised of a hybrid Connecticut desflorado and mejorado 2004 wrapper, Ecuadorian HVA mejorado seco under and a filler blend packed with Dominican HVA mejorado ligero, Dominican criollo 98 viso, Peruvian hybrid habano and a hybrid habano 2000 viso from Paraguay. The cigar is offered in a singly 6 x 54 box-pressed format which comes packaged in boxes of 24 and will run $15.50 a stick. A big thanks goes out to the Mbombay Tobak team for sending a few samples our way. The first thing that caught my attention is this is the first Mbombay cigar in my memory that carries a different band. 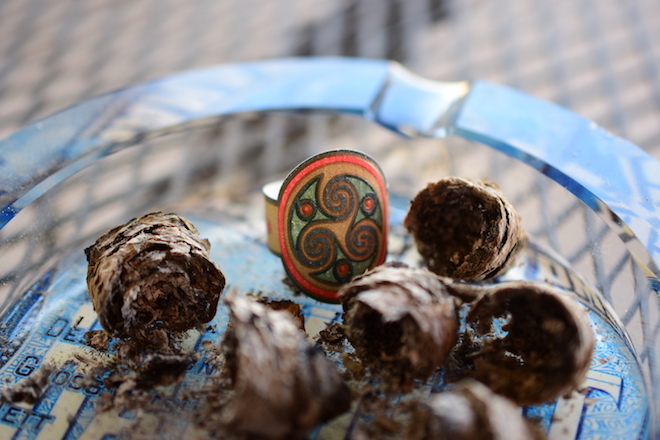 The band on the Gaaja is copper/gold in color with a red, blue, and teal wateresque medallion on the front. 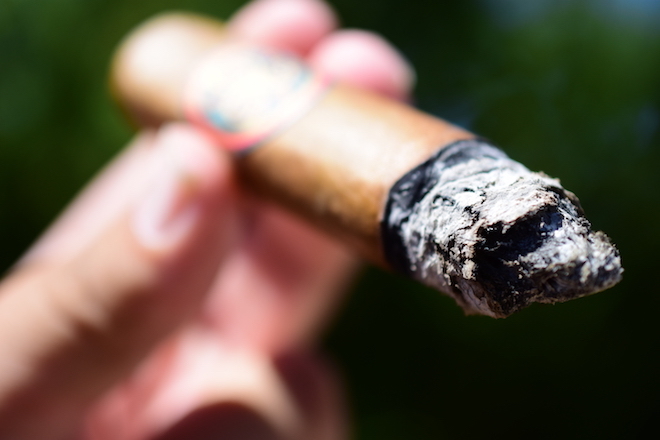 The wrapper on the cigar is a very, very consistent light to medium brown with a slightly yellow sheen. The wrapper is laid seamlessly with only a few very small veins. The wrapper’s texture is extremely smooth and silky with a decent amount of oil while the wrapper itself feels very thin and delicate. 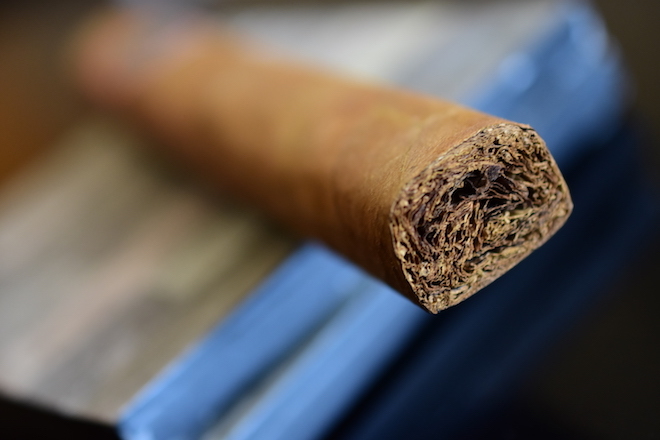 The cigar is packed tightly with the only softer spots located around the foot of the cigar. The soft box-press body leads up to a round triple cap. 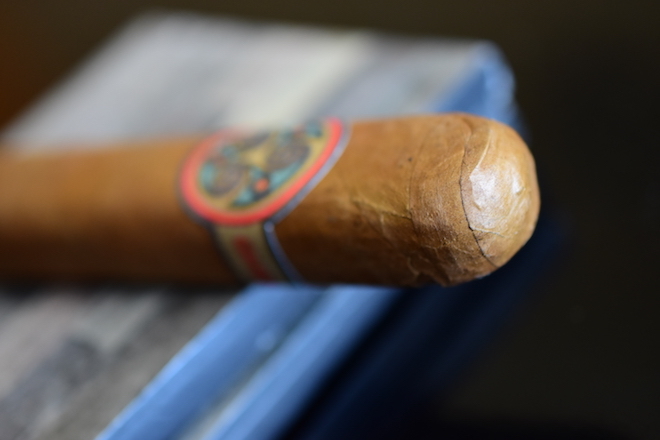 The wrapper gives off some spice and caramel aromas while the foot of the cigar carries much more spice and pepper around some earthiness and natural tobacco aromas. The cap cut very clean and like butter using my Xikar double bladed cutter. The cold draw showcases a very grainy/oaty mixture of flavors coated with tons of spice and pepper. 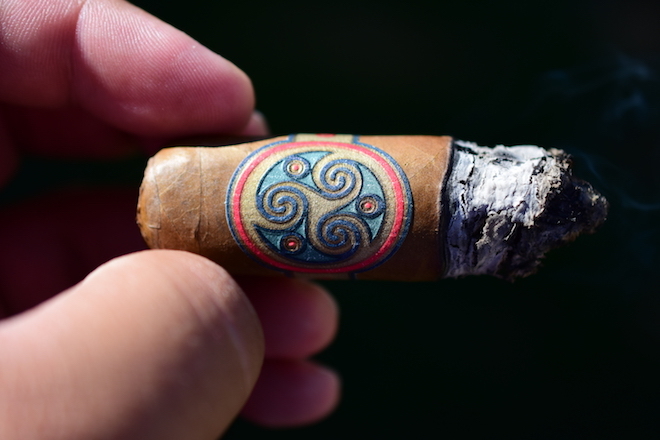 The MBombay Gaaja starts out with a great, powerful pepper blast which only lasted for a few puffs before it dissipated leaving behind a decent amount of spice, cedar, sweetness, caramel and vanilla over some soft earthiness. The flavor profile isn’t bold, but the flavors compliment each other really well. 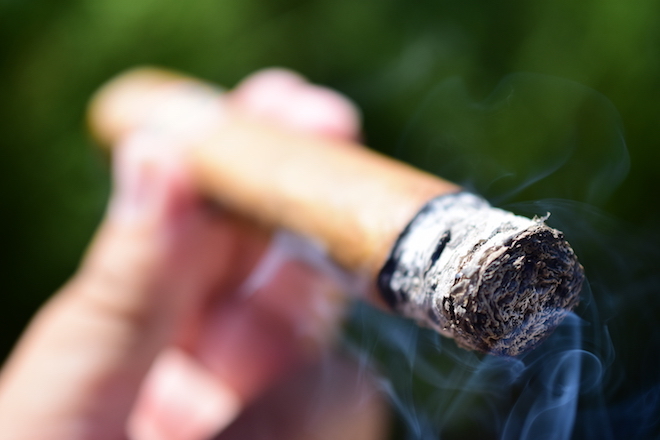 The draw is perfect which each little puff creating a thick cloud of white smoke while the cigar gives off very little stationary smoke as it rests in my ashtray. The burn line is slightly wavy, but not too concerning as it leaves behind a decently compacted trail of medium to dark grey ash which held on for about an inch before falling into my ashtray. Into the second third of the Mbombay Gaaja and not too much has changed. The cedar is the most dominant flavor now backed by spice, caramel, a bit of sweetness, and a bunch of grainy earthiness. The retrohale brings the spice and cedar up a notch. The burn line is still a bit wavy but I haven’t had to reach for my lighter yet so I’m not complaining. I close out the second third with absolutely nothing in the nicotine department. While I wished the flavors would mix up a bit, or the body would ramp up, the Mbombay Gaaja is still burning pretty much status quo. The cedar and spice are the main flavors in the mixture backed by some soft sweetness and more caramel. The flavor profile has been pretty much the same from start to finish, except they started to cream out a bit halfway through. It took me an hour and forty five minutes to smoke this cigar down to the nub and I experience no extra harshness, no extra heat, and never once had to reach for my torch despite the wavy burn-line. The Gaaja is a solid offering from Mbombay that just didn’t do it for me. There wasn’t anything really special with this cigar, and quite honestly I think I’ve just been spoiled with how much I enjoyed all the other cigars in Mbombay’s portfolio. This cigar was milder, and a bit soft in the dimension department in comparison to some of the others. I know what you’re thinking, that’s not a bad thing at all. It really isn’t. I think this cigar is going to be outstanding for those out there who really enjoy the milder smokes, but me personally crave a bit more body and flavor in my experiences. The cigar’s burn, and construction, all flawless. The price point is a bit too steep for me considering that it didn’t quite do it for me in terms of my personal wants in flavor. Have you smoked this one yet? If so, I’d love to hear your thoughts. 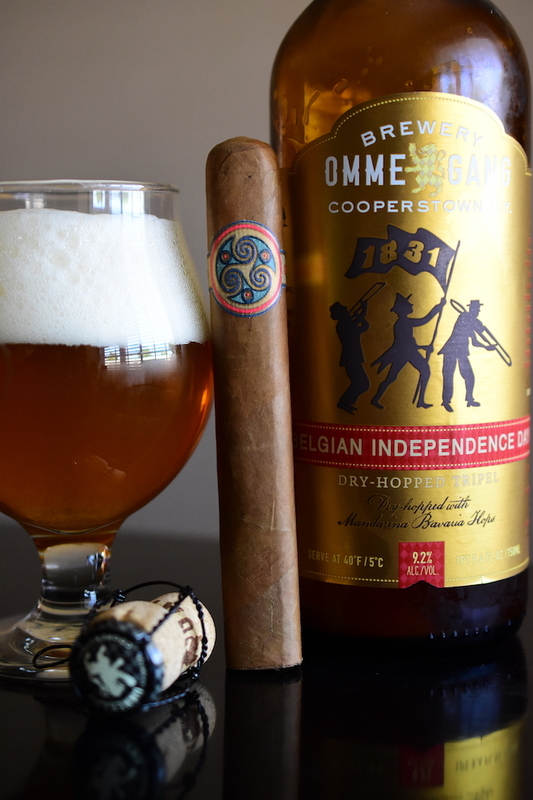 Today I decided to get a bit cliche and pair the Mbombay Gaaja with a 2015 Belgian Independence day by Ommegang. Sure, its not technically a beer celebrating our independence, but hell, its close enough. Brewed at the Ommegang Brewery in Cooperstown, New York this Dry-Hopped tripel comes in at 9.2% ABV. The 2015 Belgian Independence Day starts off with a bit of tartness, apple, spice, and caramel with a very light mouthfeel before finishing off with some light hoppiness, more apple, lots of spice, and some grainy malt with a brett-type aftertaste. This is an amazing summer beer and the caramel, tartness, and spice paired perfectly with the Gaaja. Another ideal pairing for this cigar would be some creamed coffee, or a malty marzen. Thanks for the mention TC. Great work as always. The fun part is when we have differing experiences. I think its great to compare and contrast. Thanks for stopping in Coop. I totally agree with you. I love seeing the different point of views with each review. Sometimes it’s fairly close, other times it differs quite a bit. That’s one of my favorite things about doing what we do.